Thanks mccrazydailylessons for this lovely award. It’s always nice to know that somebody out there enjoys to read the “guff” and somedays the posts on this blog really are “guff”. 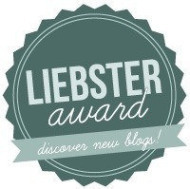 Having had a look at mccrazydailylesson own blog I discovered that the Liebster Award is given to up and coming bloggers who have less than 200 followers. There are rules that follow accepting the award. 4. Nominate 11 bloggers of your own, with under 200 followers, whom you think are as awesome as you – I’m a typical British person who doesn’t believe they are awesome, but hey I’ll go along with the rules. Well, that’s simple enough right? Below are the eleven questions that my nominator has asked me. Preston, England which is approximately forty miles from Manchester. 3. Where would you like to be? Playing on the beach, under the sun with my family. That my children are happy in life. To have a radio play commissioned, and to have a play performed in the future. Being incapacitated. I slipped a disk two years ago and it took ten months of physiotherapy to start getting my life back to come normality. I never want to experience constant pain like that again. I also don’t want to have to rely on people to put my shoes on, pick things up for me etc. To play is netball. To view is Formula 1, tennis and ice-hockey. 10. Country music or Rock and Roll? Rock and Roll all the way. 11. Who is your number ONE? I have three number ones in my life. Mr NorthernScribbler, first born NorthernScribbler and wee boy NorthernScribbler. 1. I am a Virgo. 2. My Myers-Briggs score is I N F J which means I am the same personality as Emily Bronte, Martin Luthor King and Florence Nightingale. INFJs are insightful, creative, compassionate, and dedicated. INFJs have a unique ability to understand the emotions of those around them, and enjoy using this emotional sensitivity to create warm and supportive environments for growth. 3. I have four sisters – I am second eldest. 4. I am very competitive (middle child syndrome). 5. I enjoy drinking sparkling water. 6. I learnt to swim when I was thirty-three. 7. When I was eleven I won a poetry competition for Cadburys and had my poem displayed in an exhibition in London. Unfortunately I never saw it displayed, but the competition was through my primary school Manor Road. 8. I love music from the 1980s. 10. I love the idea of @thehopefulnotes and will be posting my own notes when I visit the States. 11. I achieved my undergraduate degree when I was thirty-five. I really tried to find another blogger who I follow with under 200 followers, but unfortunately that doesn’t apply to any of them. Therefore this is as far as the Liebster Award goes for me, unless I randomly select anyone with under that number of followers. This entry was posted in Blog, Writing and tagged awards, blogging, Manchester, writing. congratulations! May your followers increase! Enjoyed the random facts.